A COMPLETE INTERIOR DEsign and shop fit for nanny outar's guyanese roti house at boxpark croydon, a shipping container complex of street-food eateries. Industrial fittings are surface mounted on hand painted patterned walls to achieve a contemporary and industrialised rustic aesthetic. timber furnishing and galvanised steel details sit alongside custom glass lighting and a hand painted logo and chalk boards. 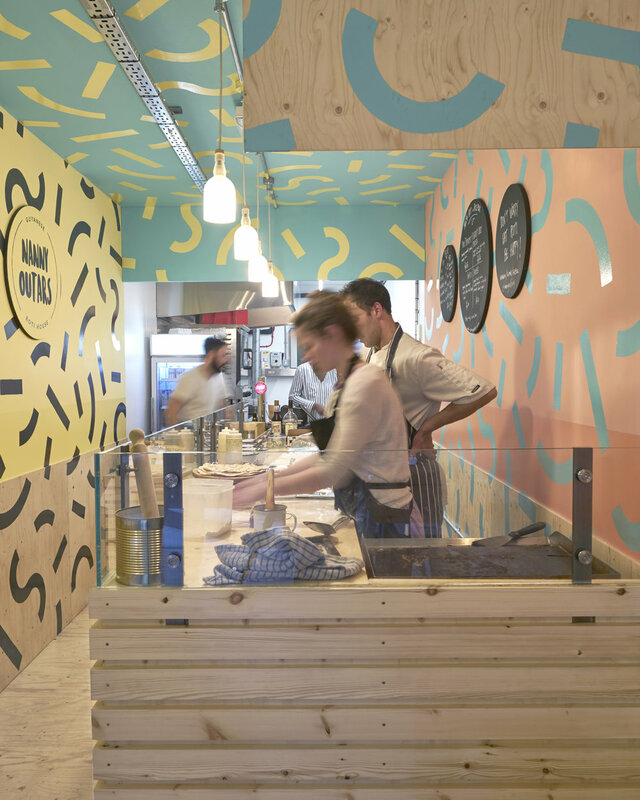 The scheme was designed to both compliment the concept of an eatery in the shipping container format as well as make best use of the constraints of the space. Designed and fitted in collaboration with Simon Sawyer. materials: pine, steeel, glass, matt and gloss paint.